Explore each of these areas below through maps, video flyovers and data. 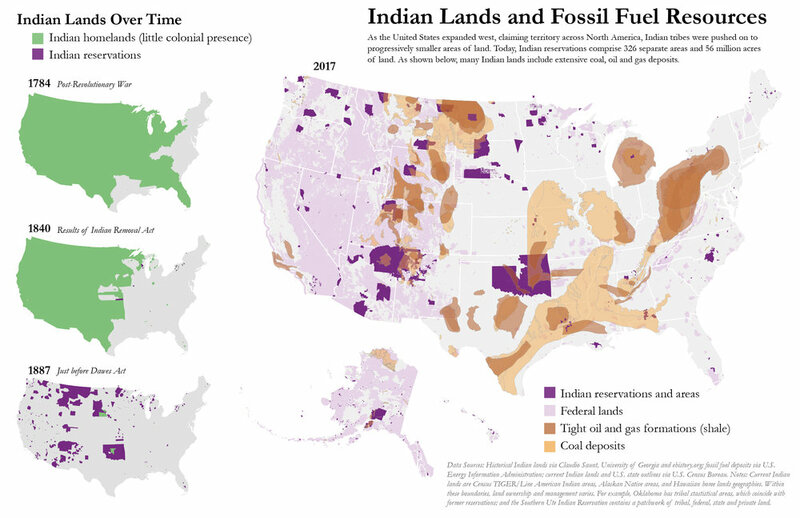 View a national map of tribal lands and fossil fuel resources, showing how this story has played out over hundreds of years. Teach about the Dakota Access Pipeline protest in your classroom with this lesson plan for nonfiction analysis, writing, and discussion. The nearly 1200-mile Dakota Access pipeline will carry Bakken crude oil from North Dakota to Illinois. As construction was underway, the Standing Rock Sioux Tribe took legal action to try to stop it. The pipeline route crosses under the Missouri River, at a site that the Standing Rock Sioux consider sacred. In this flyover, made using Google Earth Pro, you can see the location of the Dakota Access Pipeline route, the Missouri River crossing, and protest camps near the Cannonball River. Video credit: Jordan Wirfs-Brock for Inside Energy. You can download this map [PDF, 46 MB] as part of a printable data companion booklet. To find out more about the data sources used in this map, visit Inside Energy's GitHub page. Credit: Jordan Wirfs-Brock for Inside Energy. Licensed under CC BY-NC-ND 3.0. 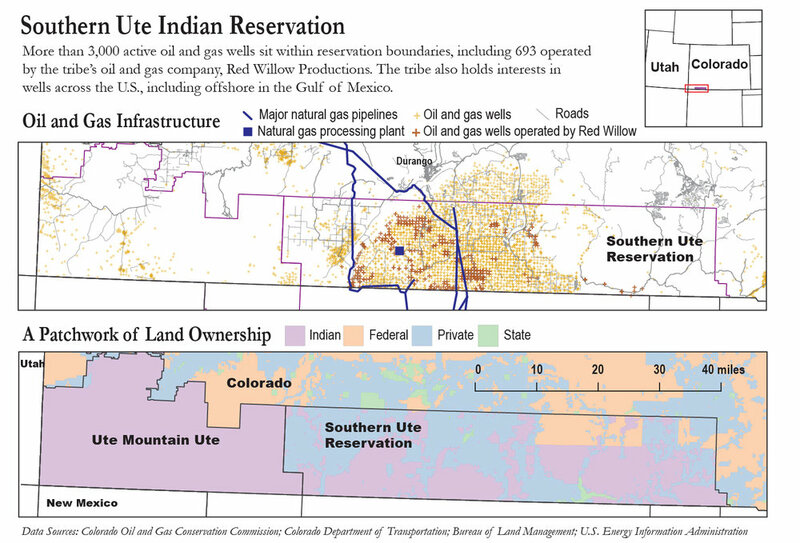 The Southern Ute Indian Reservation sits on land that is rich with oil and gas deposits. Starting in the 1980s, the tribe took control of their own oil and gas resources, creating an economic powerhouse and changing the lives of tribal members. In this flyover, made using Google Earth Pro, you can see the location of the Southern Ute Indian Reservation near the four corners region, the town of Ignacio, oil and gas development on the reservation, and the tribal headquarters. Video credit: Jordan Wirfs-Brock for Inside Energy. The new Bears Ears National Monument in Southeast Utah has become the center of a heated debate over the role of the federal government in land use decisions. Utah lawmakers want President Trump to overturn the designation of the new monument, while a coalition of tribes argues for collaborative management of monument lands. In this flyover, made using Google Earth Pro, you can see the Bears Ears National Monument in Utah, as well as nearby energy development including a uranium mill and permitted uranium mine sites. Video credit: Jordan Wirfs-Brock for Inside Energy. Current conflicts over tribal control and land are happening in the context of a long, violent history. The maps below show how tribes were pushed onto smaller and smaller areas of land, and eventually onto reservations. Many tribal lands hold significant fossil fuel resources, like coal and natural gas.